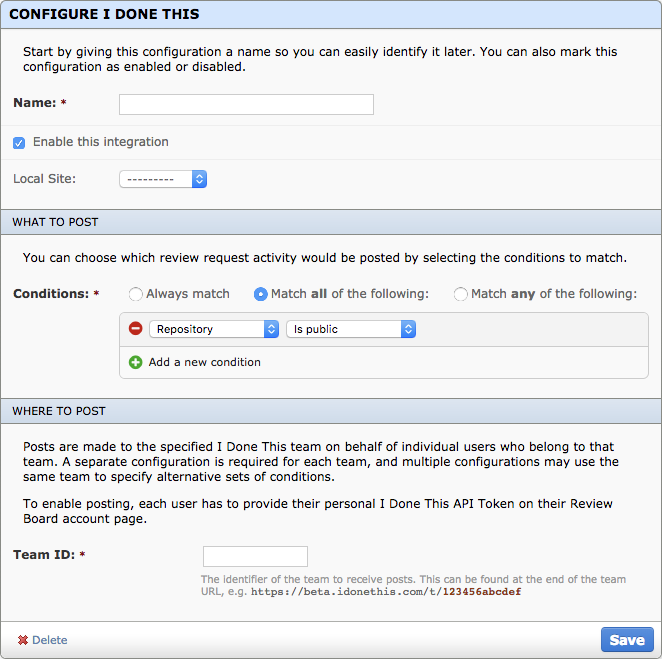 Review Board integrates with I Done This, offering flexible rules for reporting status when creating or updating review requests or participating in reviews. To configure an integration with I Done This, you need to create a configuration for the integration and then have each user configure their own I Done This API token. The integration won’t post status updates on behalf of users who haven’t configured their tokens. Click Add a new configuration for I Done This on the Integrations page in the Administration UI. Give the configuration a descriptive name. This can be anything you choose, and is only important if you plan to have multiple configurations. Select the conditions under which status updates should be reported to I Done This. Conditions allow you to limit reporting to certain groups or repositories, or other criteria that you choose. To always report status updates, select Always match. Enter your I Done This Team ID. You can find this in the URL when logged in to your team. For instance, if your URL is https://beta.idonethis.com/t/123456abcdef, your Team ID would be 123456abcdef. At this point, I Done This should be configured. Now it’s up to users to configure their API tokens. In order to report status updates to I Done This, users need to add their own API Tokens in their My Account page. A new I Done This section will appear in their list of settings, with instructions on specifying the token. Tokens can be found on the Account Settings page on I Done This. Simply copy and paste that token into the field on the My Account page to enable posting. The token can be removed to disable posting.